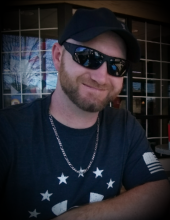 Kenneth “Ken” Scott Tufnell, of Jackson, formally of Brighton, passed away unexpectedly on March 13, 2019. He was 32 years old. He is survived by his wife, Brandy of 8 years; son, Blake Gordon Tufnell; mother, Cindy (Jack) Whyatt; father Jim (Angela) Tufnell; brother James (Sarah) Tufnell; mother-in-law, Kelly (Gary) Campbell; brother-in-law; Terry Byrne; nieces and nephews, James Logan, Lilly, and Karleigh Tufnell; also many extended family and dear friends. A Funeral Service will be held at Lynch & Sons Funeral Home, 600 E. Main St. Brighton, on Tuesday, March 19th, at 1 PM. Visitation will be held at the funeral home from 11 AM until the time of service. Pastor Zack Stephens (242 community church) to officiate. In Lieu of flowers memorial contributions are encouraged to the family. For further information phone 810-229-2905. "Email Address" would like to share the life celebration of Kenneth Scott Tufnell. Click on the "link" to go to share a favorite memory or leave a condolence message for the family.